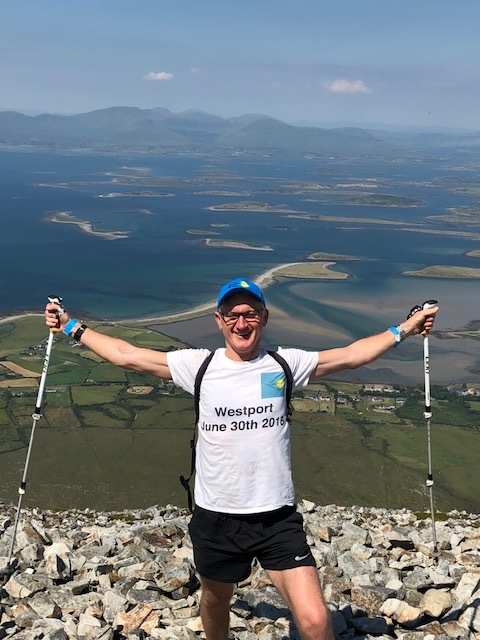 The Sunriseupcroaghpatrick 2018 weekend activities in Westport were a great success and we would like to thank everyone who helped make it so fantastic. 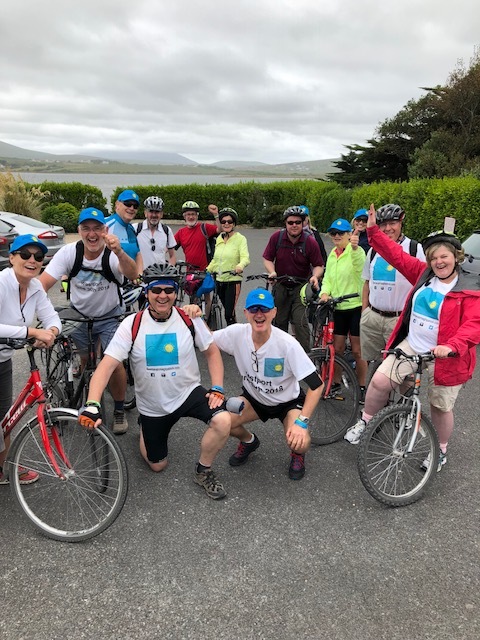 We had over 150 people who climbed and walked to support our Charities on Sat June 30th, over 50 people who attended our Dinner event on Sat night in the Westport Plaza Hotel and over 20 who cycled the Western Greenway on Sun July1st. We had super weather, great Craic enjoyable Challenges while all the time helping our chosen Charities. We raised c €20,000 in total across our chosen Charities: Young Parkinson’s Ireland, Huntington’s Disease Association of Ireland and the Irish Motor Neurone Disease Association. We want to thank all those who supported the event last year and we look forward to your continued support this year. 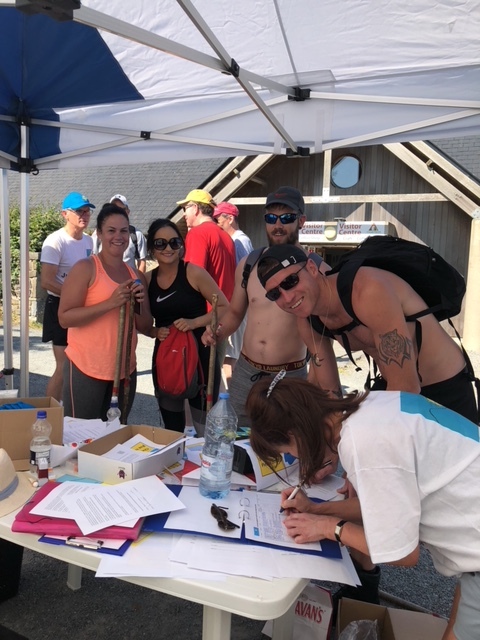 Click the Tickets tab above or below to register your interest in participating or supporting the 2019 event on June 29th. 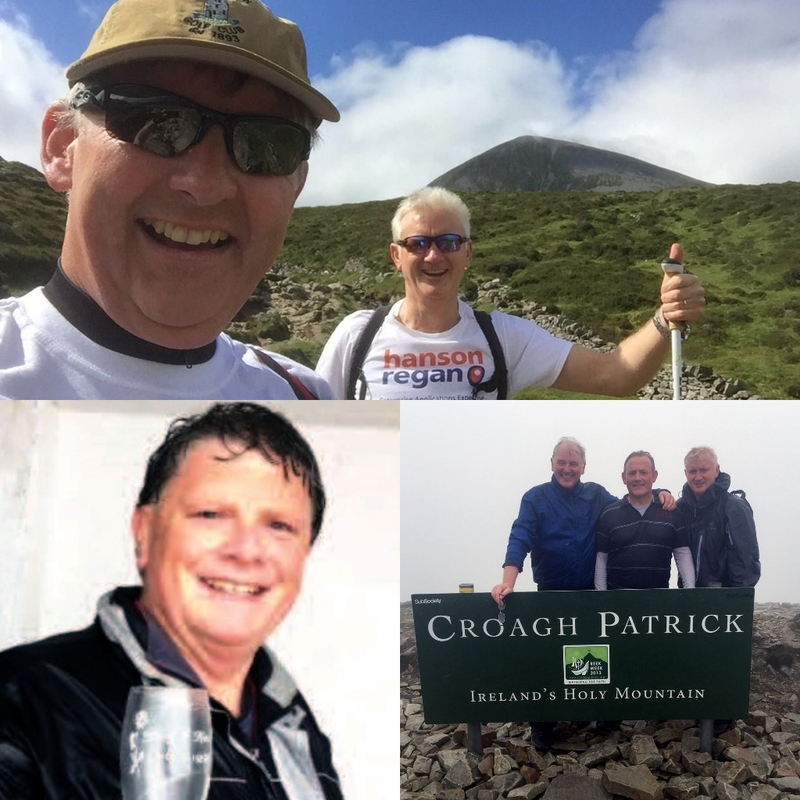 “Sunrise Up Croagh Patrick” is an annual get-together of friends who climb Croagh Patrick or walk nearby, have a super time & raise funds for worthwhile charities fighting Neurological Diseases. Funds raised go towards providing increased Specialist Care. It was initially organised by John Kelly (St Jarlaths 1979) and supported by his University classmates and work colleagues from Hanson Regan. 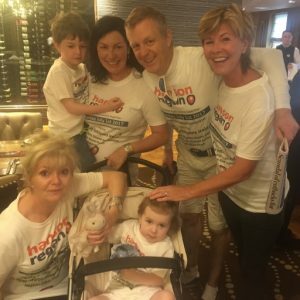 The event has grown and attracted wider support from many great people who have been affected by Huntington’s Disease, Parkinson’s, Motor Neuron Disease & Dementia. Last year’s event was on the weekend of 30 June 2018 and we had a wonderful couple of days blessed by the weather for our Climb & Walk. We had a post event dinner and we stayed at the Westport Plaza Hotel. They have kindly extended a special deal again this year €209 for two nights sharing B&B + 1 dinner. So why not join us for this great weekend of activities in Westport on 29th June 2019 , our 5th annual #SunriseupCroaghPatrick event. You can choose to Climb Croagh Patrick or Walk the Murrisk Loop Walks. Both will start from the Croagh Patrick Visitor Centre c 10am. Form a group of your colleagues and friends, or come on your own and mingle with the whole gang. Enjoy great craic and support very deserving charities. Register your interest by clicking on the Ticket tab above or register button below. We will follow up later with the full sign up process where you can choose which elements (Climb, Walk, Dinner) you would like to book. 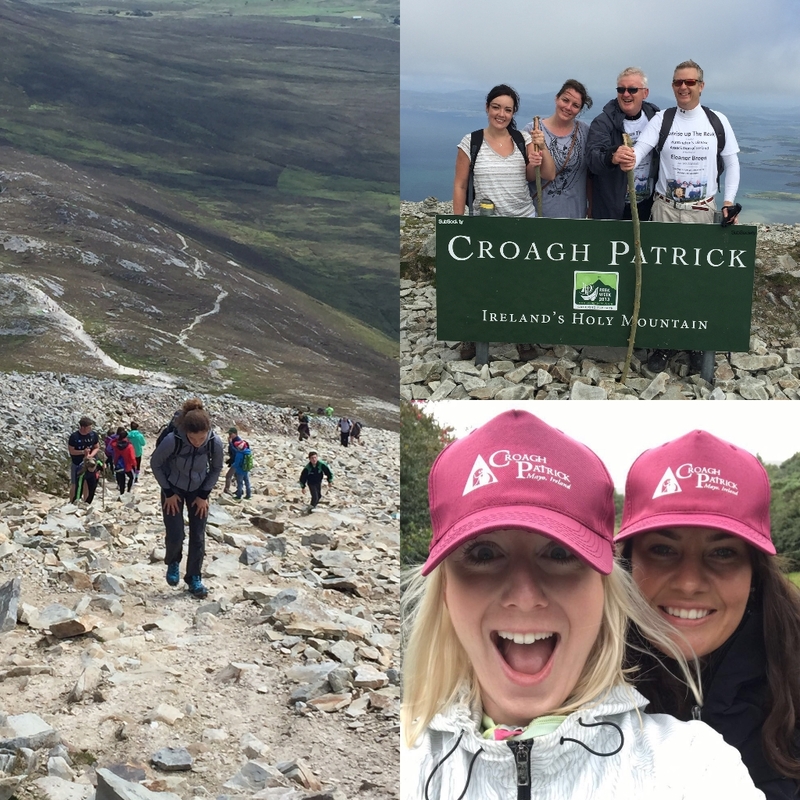 Next Event – 29th June 2019 – Please join us for our Sponsored Climb Up Croagh Patrick or Walk nearby to raise much needed funds for Neurological Disease Specialist Care. Simply click on the Tickets tab above or button below to Register your own interest in participating. Also let us know how many other people might be joining you. Hotel: Weekend deal available at the Westport Plaza Hotel, 2 Nights BnB + 1 Dinner €209 per person sharing, single supplement €35. NB, If you wish to stay at other venues remember Westport is a very popular destination so we recommend booking as soon as possible to avoid disappointment. 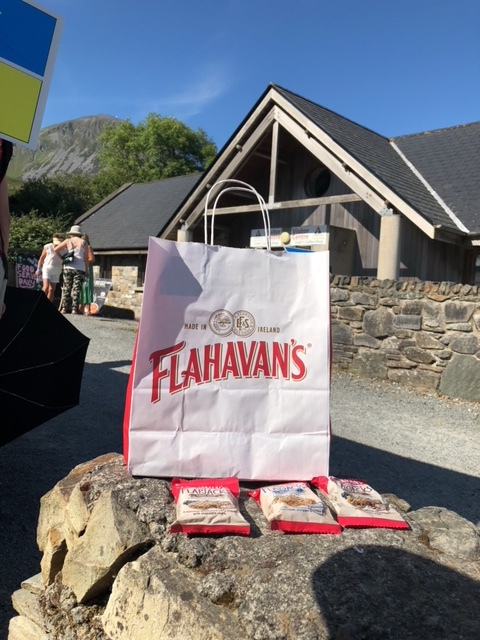 Walk & Climb: 9.30am Saturday June 29th Climbers and Walkers to meet at the Visitors Centre at Croagh Patrick for check in. Please check in & out at the Sunriseupcroaghpatrick desk at the Croagh Patrick Visitors Centre before and after the climb or walk. (Bring some coins for the Car Park). Climb: When we say climbing, its not vertical, no ropes, no scrambling, with a bit of care, its well within the reach of most people (click the video link here to see what it was like last year). 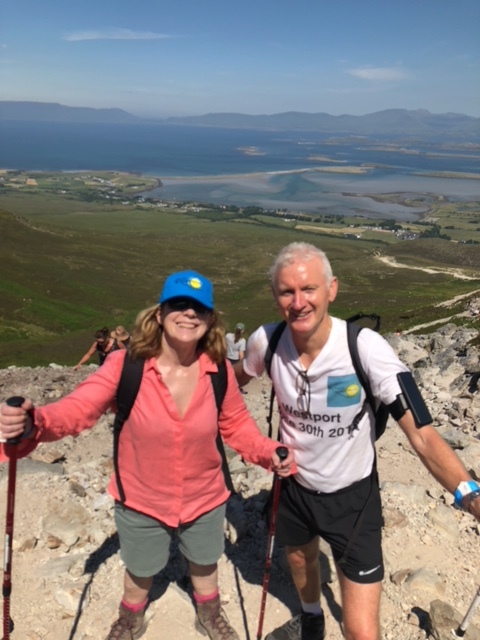 Walk: For those who would prefer to walk rather than climb we will also have a 4Km or up to 11Km low level walk near Croagh Patrick. See the choice of walks on the Murrisk website: http://www.murrisk.ie/T-VillageWalks.html. To register your interest for the climb or the walk click the register button above. Dinner: Please join us for dinner at 7.30pm on Saturday night in the Wesport Plaza Hotel. Once you register your interest in participating in the event we will contact you with more details for the final registration. We are running this event to raise much needed funds for very deserving Neurological Disease Charities. We would be most grateful if you would agree to seek sponsorship from your friends, family and colleagues. All participants are encouraged to set up an iDonate fundraising page. To do this please click on ‘Fundraise’ in the main menu above. This takes you to the ‘Fundraising Page Set Up’ section. Just follow the steps. If you would prefer to use a printed sponsorship card please email us at sunriseupcroaghpatrick@gmail.com with your name and address and we will forward it to you. Once we have compiled the registrations of interest we will revert to everyone later to complete the sign up process. Thank you for your interest in participating & fundraising for these great causes. We would like to offer you the option to create an iDonate on-line Sponsorship Page or to use a Sponsorship Card to facilitate your fundraising. 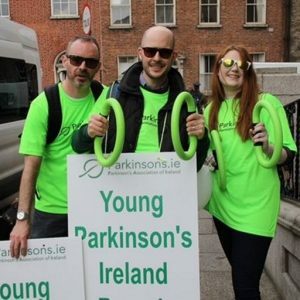 In the section titled ‘Who are you fundraising for?’ enter and select all the following names of our chosen charities: Young Parkinson’s Ireland, Huntingtons’s Disease Association of Ireland and Irish Motor Neurone Disease Association. Donations will be automatically split equally between the 3. If you prefer to choose one charity from this list of 3 – donations will only go there. Once you see the relevant charity come up then ‘select cause’. In the section titled ‘What event are you taking part in?’ choose ‘Select an event from our events list’. Then choose June 29th and select Sunriseupcroaghpatrick in the ‘other events section’. Then enter your fundraising target amount and click next. Then upload a profile image. This is important to give confidence to your contacts that it is you they are supporting. Then enter your email address and submit. (You must enter your email to receive notification of donations to your page). Then enter your name and create a password to keep your page secure and to enable your login. Then create a personalised short simple url for your page e.g. https://www.idonate.ie/johnschallenge . You can send this to your contacts so they can click directly to your fundraising page to support you. Make sure to send the link to your fundraising page to all your contacts via email and all the social media platforms that you use. Once you have completed your page you can log in anytime using your email and the password you created. You will see options to edit your page, thank your donors and promote your page via Facebook & Twitter. If you would like to use Sponsorship Cards please email us at sunriseupcroaghpatrick@gmail.com with you name and postal address and we will contact you with details of the process and the cards. How a family tradition turned into an international annual gathering. We’d been up Croagh Patrick a few times. Dad’s birthday is July 17th, so we’d come home for his birthday and climb Croagh Patrick that weekend. 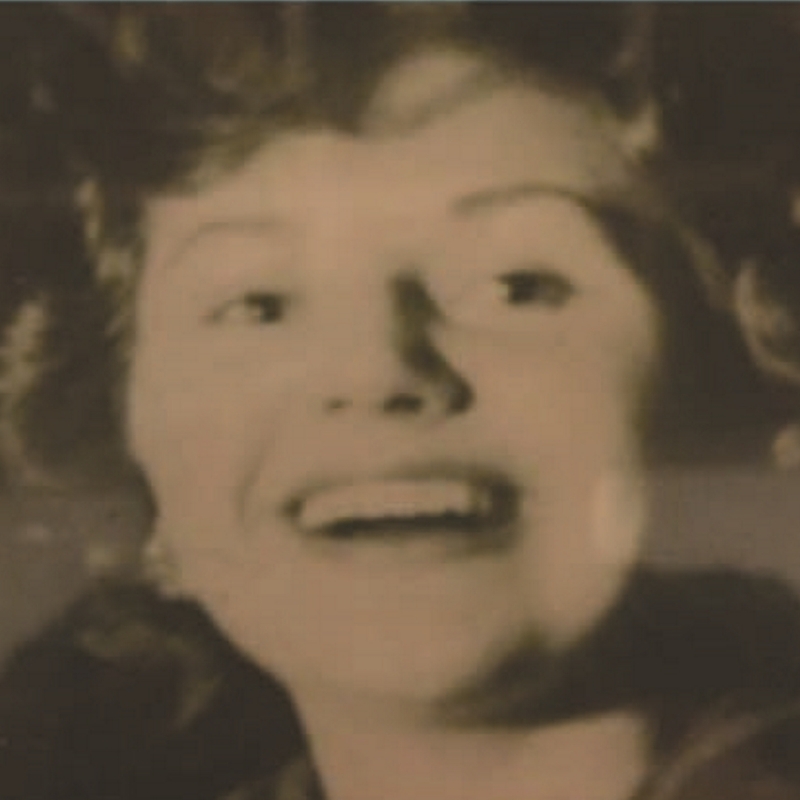 In January 2016, my mother-in-law, Eleanor, passed away with Huntington’s disease. 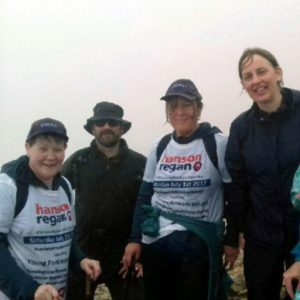 It wasn’t until the middle of May it dawned on us to dedicate the climb to the memory of Eleanor and in support of the Huntington Disease Association of Ireland (HDAI). Two of us climbed that year and we raised over €5k for HDAI. When we got back to London, the team were so impressed with the pics, they immediately said “We definitely want to do this next year!”. And so the inspiration grew. 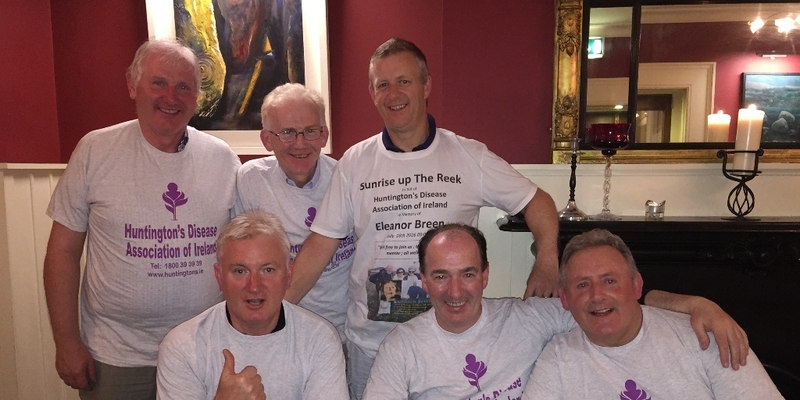 . . .family, friends, work colleagues and supporters of each of the Charities joined in the cause so we had 40 people participate in the 2017 climb resulting in a total of €15k being raised across the Charities. We aim to make it even bigger again this year. Hopefully you can join us. Can we say just how important these Associations are. These are the organisations who champion the patients and families of people who contract these neurological conditions. They are in your corner from the moment you get connected. They hold your hand throughout. The difficulty is that they are self funding and need proper help. None of them have enough specialist nurses to help in the community. IMNDA, have over 350 patients in Ireland, with 3 nurses covering the country. And HDAI have somewhere in the region of 750 patients, they are not sure, with 3000 people at risk; they don’t have any nurses. Ireland has 34 Neurologists; it can take 6 months to see one, even if you have the money. On average, it takes over 2 years to get a diagnosis, or it did in our case. The Associations exist because they are needed, with a bit more help they could do so much more. To donate please click the button below. Thanks to all who make the effort to give, many of us think about it but never do. All donations given here go straight to the charities via iDonate who charge handling fee of 5%. You can choose to pay this so the charities receive 100%. Check further details on our chosen charities by clicking the charities tab above. Thank you. When you click the donate button below you will be taken to our idonate.ie Sunriseupcroaghpatrick Fundraising Team Page. There you will have a number of options on how you can donate. Various other members of our Fundraising Team have donation pages you can choose to support. 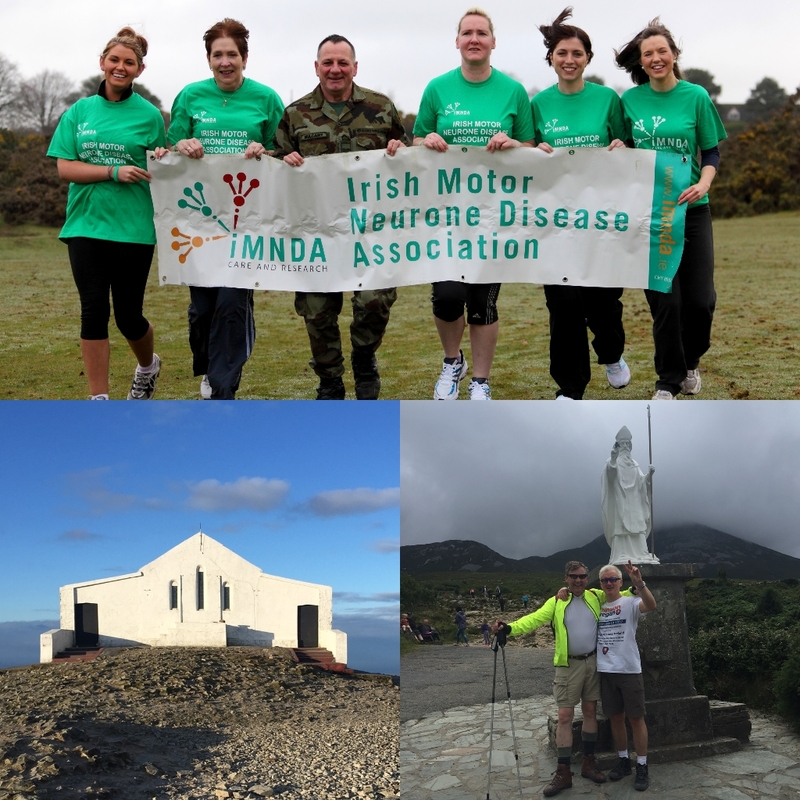 The Irish Motor Neurone Disease Association (IMNDA, CHY 8510) is the only organisation of its kind in the country. We are dedicated to working on behalf of people living with MND and their families and carers. Our key services include home visits by our 3 MND nurses, financial assistance towards home help and the supply of specialised equipment on loan. We also fund and promote research into the causes and treatments of MND.